Hello there, I’m Olga! I was born and raised in post-soviet Latvia and now I live in Ecuador as an expat. In my blog The Russian Abroad I write about my travel experiences around Ecuador and the whole world. 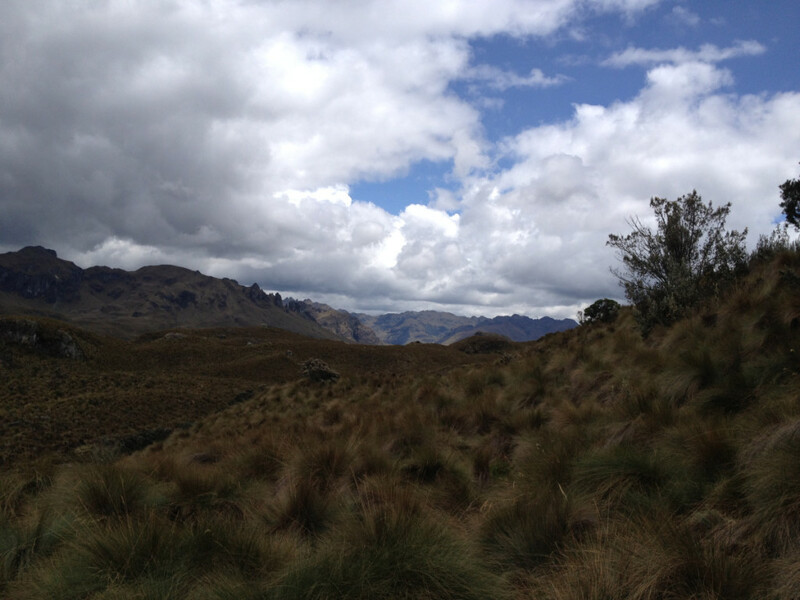 Let me tell you about this one time I went to national park El Cajas that is in Ecuador – an experience I will always remember. Slowly but steadily, Ecuador is gaining reputation as the top-destination in South America – and in the whole world. And indeed, as one of the most biodiverse countries on Earth, Ecuador is a paradise for people of most different tastes: gourmets, adventure lovers, history geeks, eco-travellers, and, of course, nature admirers. To the delight of all those who love to explore nature, the country offers 11 national parks, 14 reserves, and 10 wildlife refuges. They are all worth the visit, but there’s one in particular that is so stunning that it just has to be on your Ecuador’s bucket list if you ever visit the country. I am talking, of course, about El Cajas. National park since 1996, El Cajas is located just some 30 km away from the famous city of Cuenca, or 183 km from Guayaquil, which is about a 2.5 hour drive on the car. El Cajas is situated in the Andean mountains and is therefore very high – altitude varies from 3100 to 4450 m above sea level, which is way higher than Quito, Ecuador’s capital and second highest capital in the world after La Paz, Bolivia. Therefore, if you rent a car to go up the Andes to visit El Cajas, keep in mind that you have to ascend slowly and descend even slower, otherwise you can get soroche – altitude sickness. I made a mistake of speeding up and my ears were blocked for three weeks after the trip. The best way to deal with soroche is to eat some chocolate and to ask for a cup of canelazo – a sugary alcoholic beverage traditional for the Andean highlands of Ecuador, Peru, and Colombia. Be sure to reduce physical activities, such as biking and hiking, during your very first day in El Cajas, or you will put yourself at risk of getting so dizzy and weak that you’ll have to stay motionless in bed with an oxygen balloon next to you and tubes in your mouth and nose. Not a pleasant experience, let me tell you that. 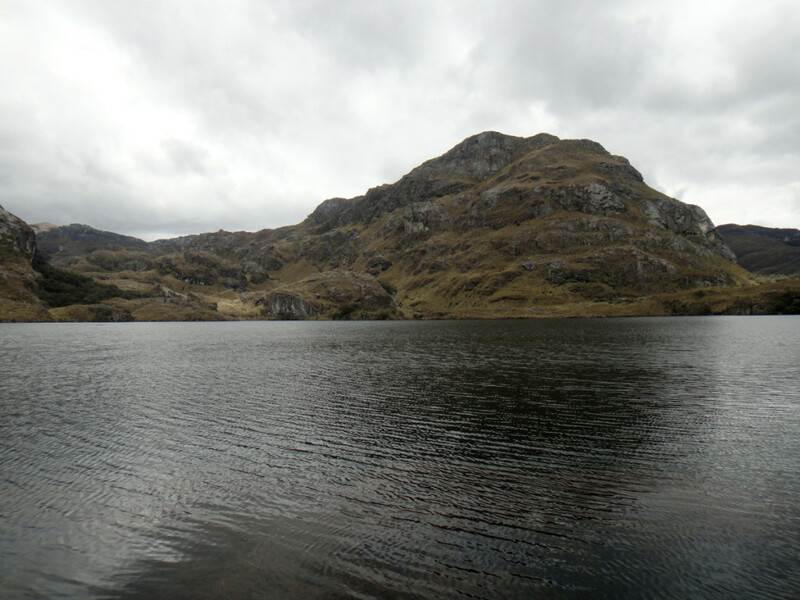 El Cajas is a place with the most stunning views of lakes and lagoons in total numbering 270 on the whole territory of the park. These grave and tranquil lakes are all of glacial origin and have crystal clear, mirror-like water that sets an enchanting atmosphere to the whole place. Beautiful grasslands sprawl as far as the eye can see and merge in brown and gold colours with some sprinkles of white, yellow, and pink. If you happen to drive to El Cajas from Guayaquil, which is hot and humid, you will be amazed to see how landscape changes from tropical to tundra. With every kilometre that you accomplish by moving upward the Andes, there are less and less palms, exaggerated tropical flowers, and bright colours, and more of serene tranquillity of mossy forests. Trees get cosily wrapped in clouds and seem to be half asleep – in fact, it feels like nature itself is dozing to the music sounds of the mountain brooks and rivers. When you get above 3000 meters, you can find yourself in Polylepsis forest, which is considered to be one of a kind in the whole world. Its trees, also known as “paper trees”, are 8 to 10 meters high, ancient, and have tangled branches, which gives an impression that you’re being in some fairy-tale written by the brothers Grimm. 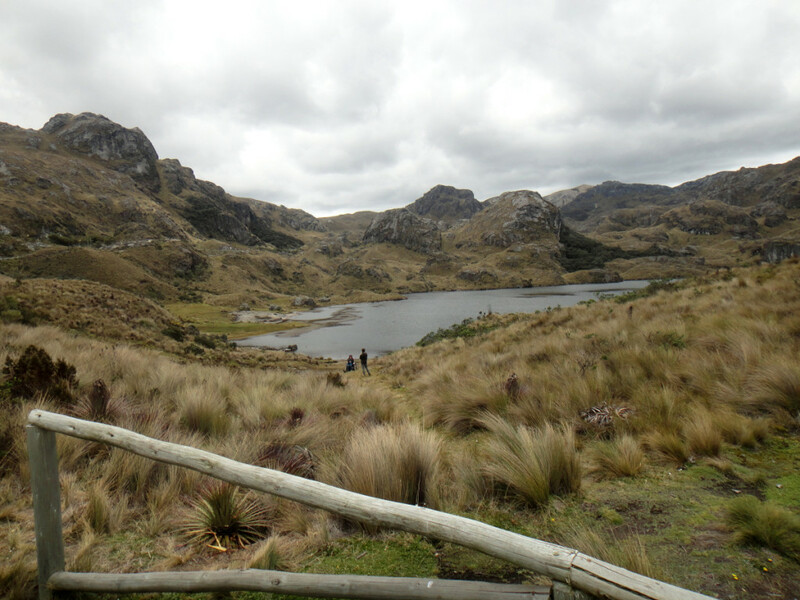 The national park El Cajas is a perfect place for birdwatching, as this place is a home to a number of rare birds, some of which are even endangered. There’s a famous South American condor, of which only 80 is left throughout the whole Ecuador, and also the largest hummingbird in the world. You can also spot different types of cats, rabbits, water mice, porcupines, weasels, skunks, opossums, and even pumas, which can be pretty exciting if you’ve never seen one. 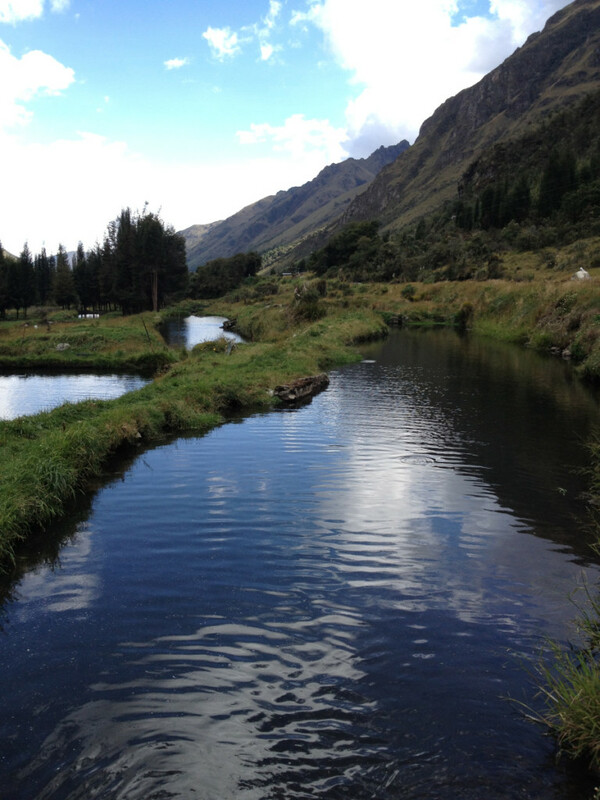 There are a number of activities you can enjoy in El Cajas apart from exploring wildlife. The national park is a popular place for hiking, mountain biking, and fishing. 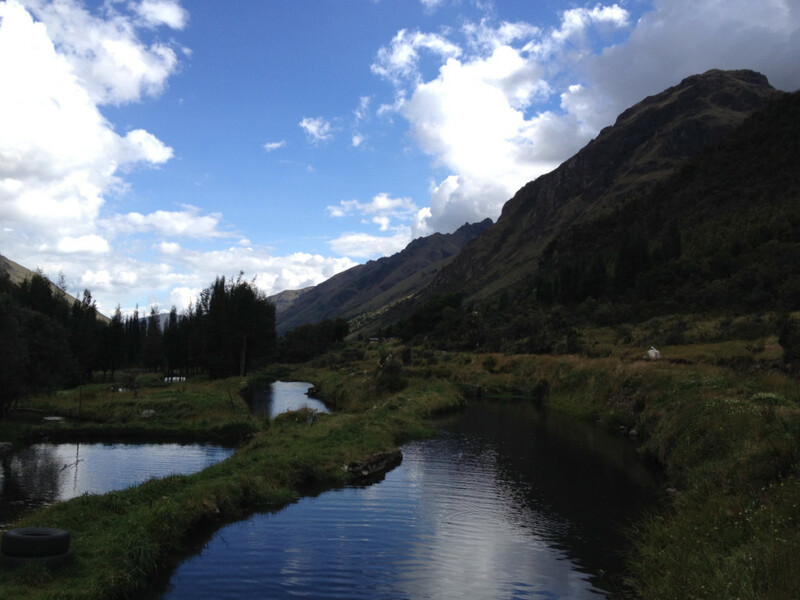 It’s prohibited to fish in the rivers, though, because El Cajas is a protected area, but there are quite many fishing spots that charge just few dollars per kilo for all the fish you caught. You cast the line with the most plain fishing rod that exists out there (basically a stick with fishing line), and can also buy some bread rolls to use as bait. But what I decided to do instead was to dig for worms myself – found quite a few and was proud to see that my efforts were repaid later when I caught my first ever trout. While you are in El Cajas, a great suggestion would be visiting Ecuador’s indigenous town Guavidula if you want to learn something different about South America. Guavidula was not only a home to a little community of indigenous people – it also served as pass-through spot that stood in the middle of a road built to connect the mountain and the coastal areas of Ecuador, la Sierra and la Costa. There were only about 100 people living in Guavidula and trying to earn a living by working in a local mine, la mina Encantada, that was believed to have gold but instead only had pyrite – a mineral very similar to gold’s shine and also known as “fool’s gold”. Due to such unsuccessful gold mining, Guavidula was gradually decreasing in population until its last inhabitant left the town in 1920 in search of a better life. 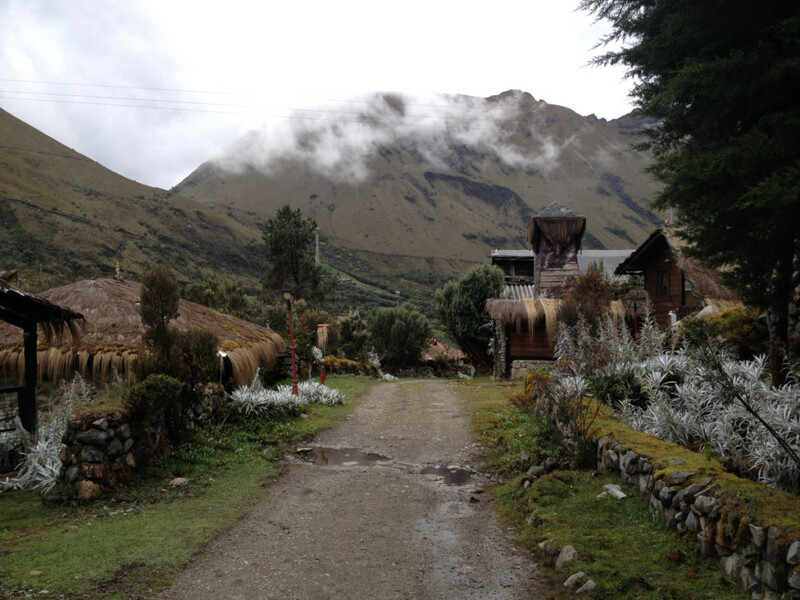 Now, the village is a historical museum that represents indigenous Ecuador at the beginning of the last century. If you’re looking for some luxury travel experience, Hosteria Dos Chorreras is a perfect place for you to stay. 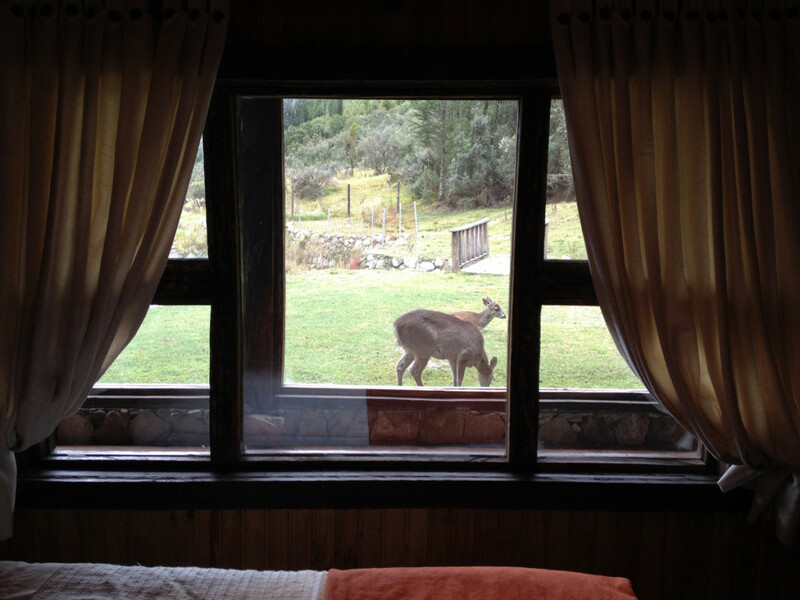 Situated in the very heart of El Cajas, it has the most spectacular views and has a real wildlife refuge feeling: there are deer peacefully nibbling grass just within an arm’s reach, black swans gracefully swimming in the river, horses, a waterfall paving its way through the hotel, and gorgeous mountains sinking in the clouds. You can also opt for something a bit cheaper and less extravagant, or not worry about finding a hotel in El Cajas anyway if you are staying in Cuenca. The city is so close to the park that most people just choose to make day trips and don’t complicate anything. Since the national park is located high in the mountains, it can get quite cold up there. So dress like an onion, with a lot of layers that will allow you to always stay warm: several light layers are better than just a thick one as the air between the layers stays warm, too, and therefore works as a kind of heat shield. Sometimes, however, when the sun comes out, the weather can get surprisingly hotter – again, being dressed in layers helps as it’s easier to strip off some clothes when necessary. At the same time, when the weather changes constantly out of the blue, putting clothes on and off may get annoying and still make you sick – I was wearing about 10 layers of everything and still managed to catch a cold. 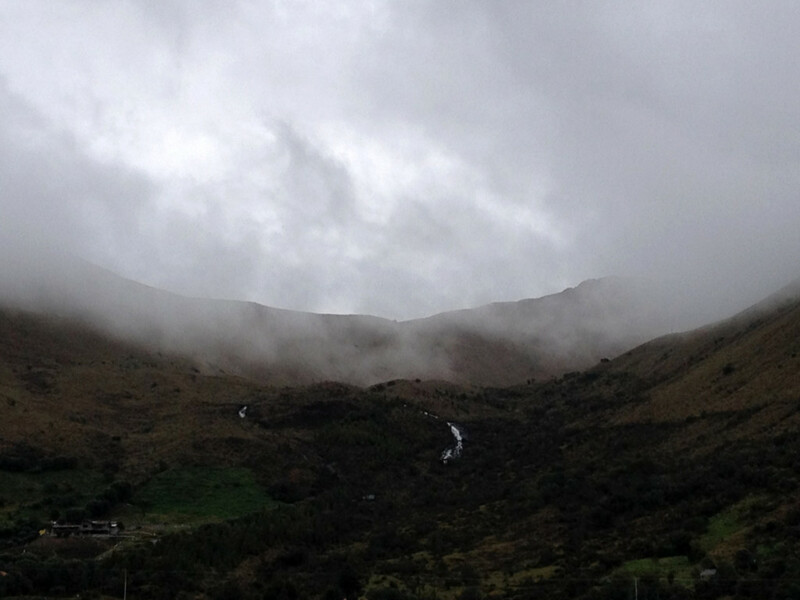 El Cajas is indeed a real gem of Ecuador. It is currently a candidate for UNESCO’s World Natural Heritage Site, globally recognized as important bird area, and is listed as a Ramsar Wetland of International Importance (managed by UNESCO, too). 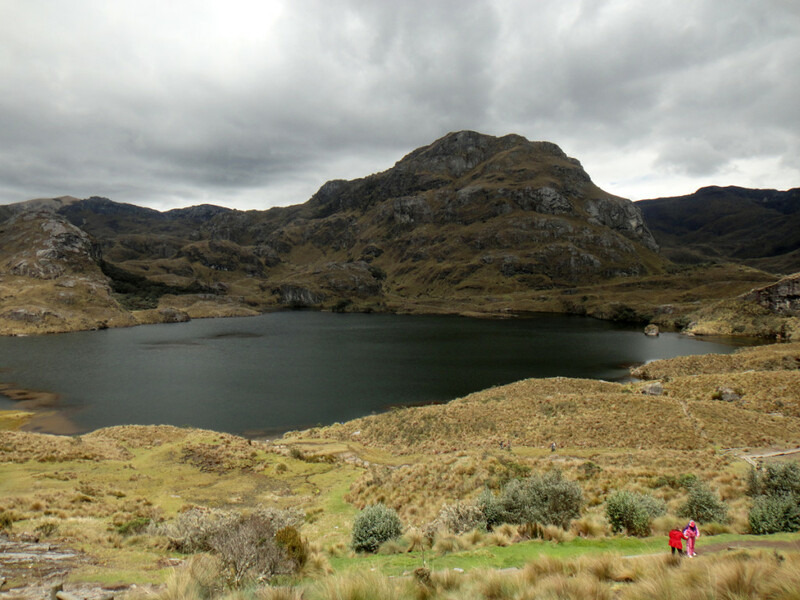 Wherever you’re a backpacker that lives under 5$ per day, a normal tourist, or a luxury traveller, national park El Cajas is a place to see. Your Questions Answered – Is Colombia Safe?